Simple, secure and seamless collaboration on any device. Hosted by Gladinet. 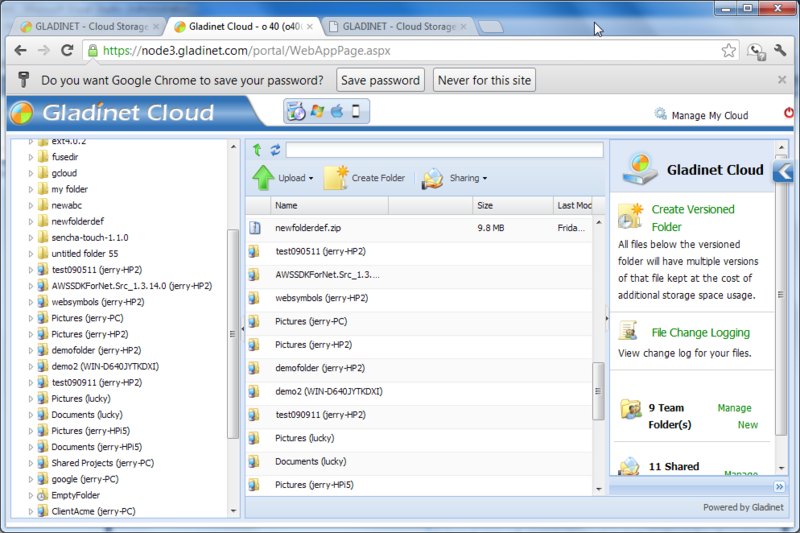 Gladinet Cloud Team Edition provides access methods from a web browser, native desktop client, iOS App, Android App and file server. When you are on the road, you can use the mobile applications to access your files. When you are in the office, you can connect to your on-premise file server for access. You can also access them from your desktop at home or use a web browser from any location on any client. 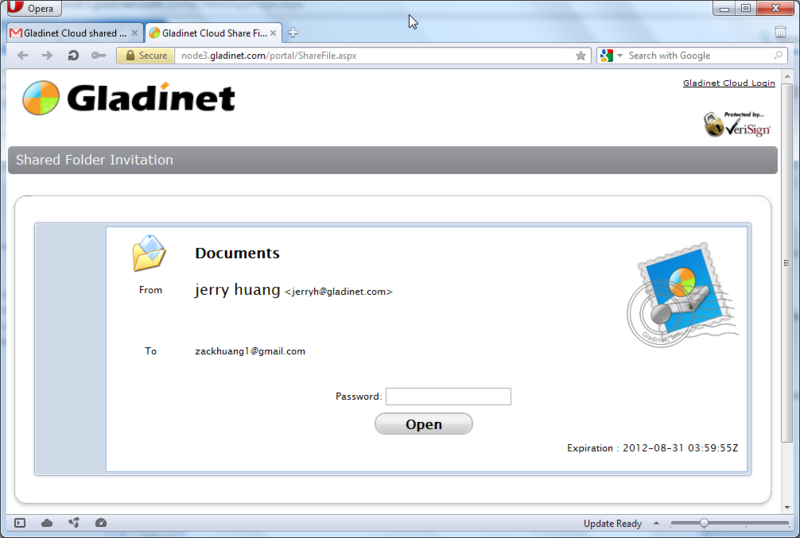 » Access all your files from any web browser Gladinet Cloud can be accessed from all major browsers, including IE, Firefox, Chrome, Safari and Opera. 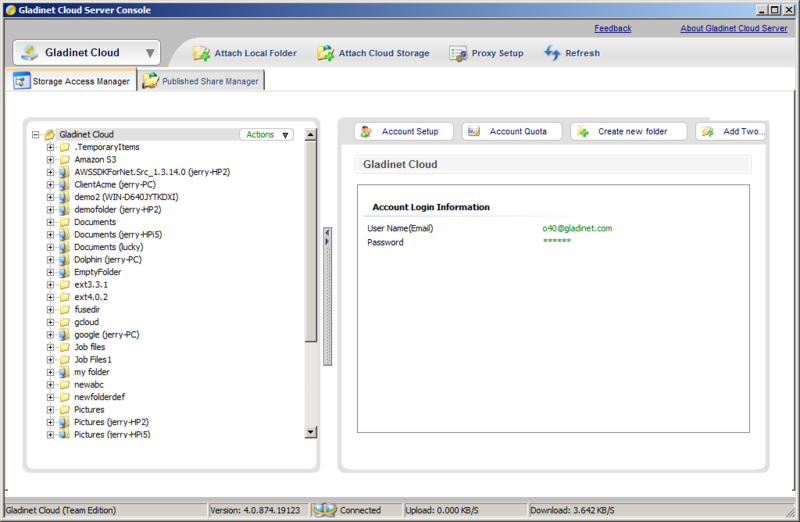 » Map your storage account as a network drive Having a drive letter on your desktop for cloud storage access is very easy to understand and use. 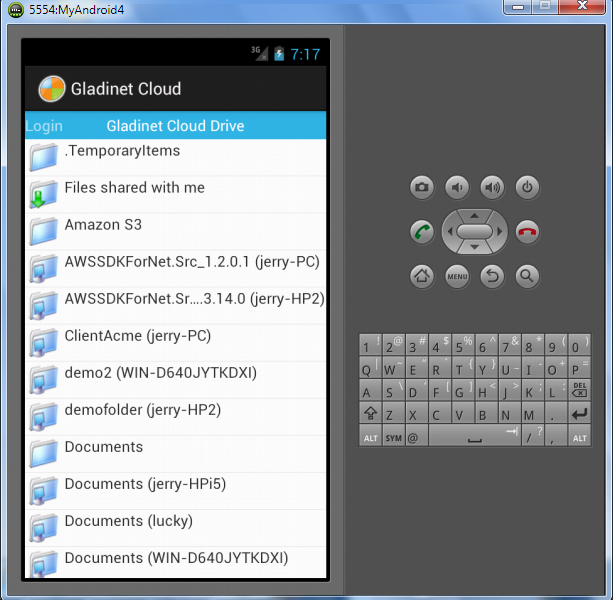 » Access your files from your mobile device You can access Gladinet Cloud from your iPhone, iPad, Android or Windows Phone 8 devices with native applications. 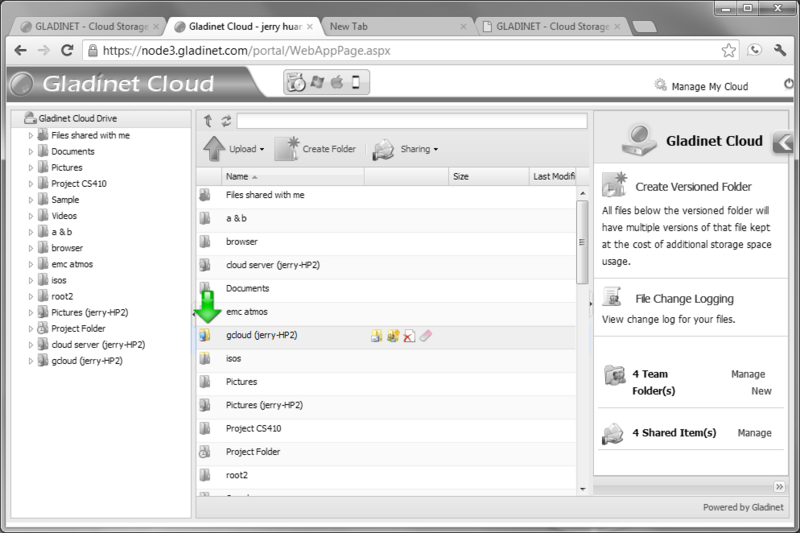 » Mount your storage account as a file server volume You can install Gladinet Cloud Server on your existing file server to seamlessly migrate it to the cloud. 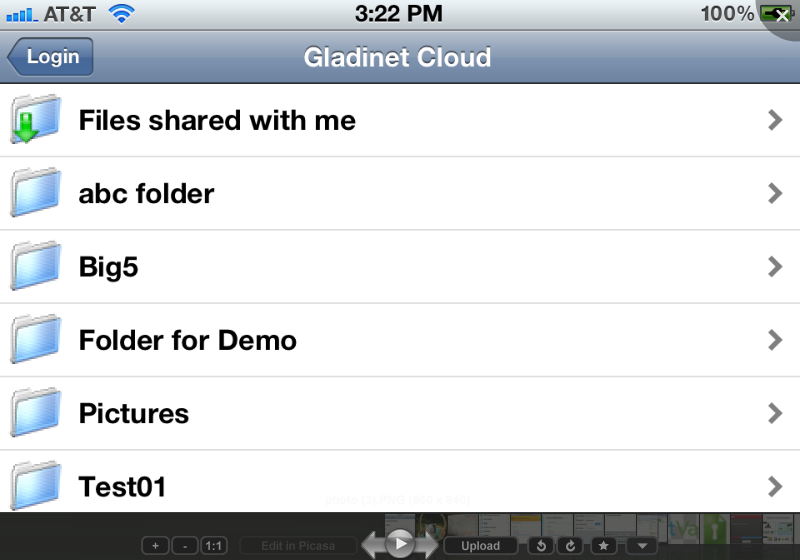 Gladinet provides unique synchronization technology that allows you to attach local folders to cloud storage. Attaching a folder means that its contents immediately become accessible to any device from any location (even before the sync is finished). It also means that the attached folder will be synchronized with the cloud and any changes made in the cloud from a remote mobile device will be synchronized back to the attached folder. This is a powerful solution with no bulk ingestion roadblocks. 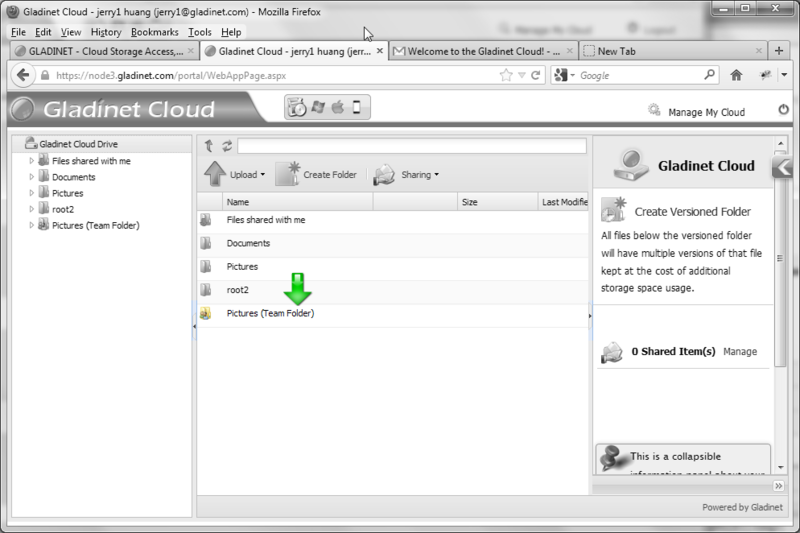 » Sync ANY local folder to cloud storage You can right click any local folder and select "Attach to Gladinet Cloud". 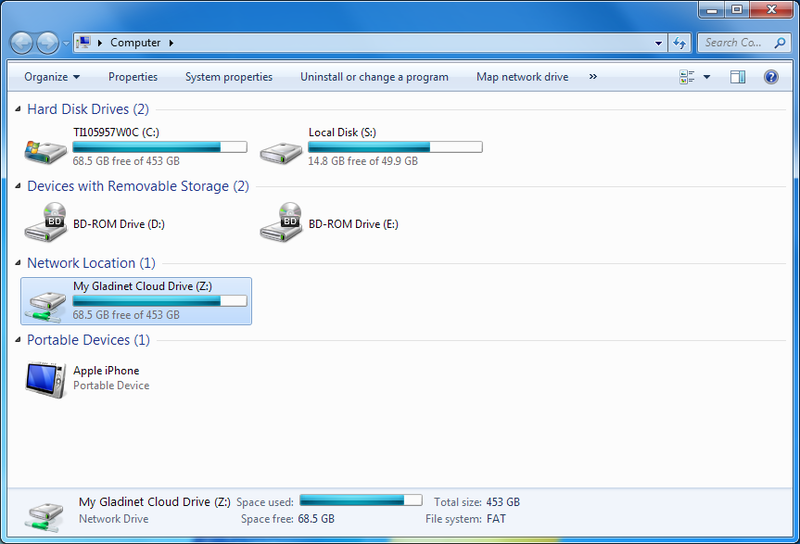 The attached local folder will be synchronized with the cloud. 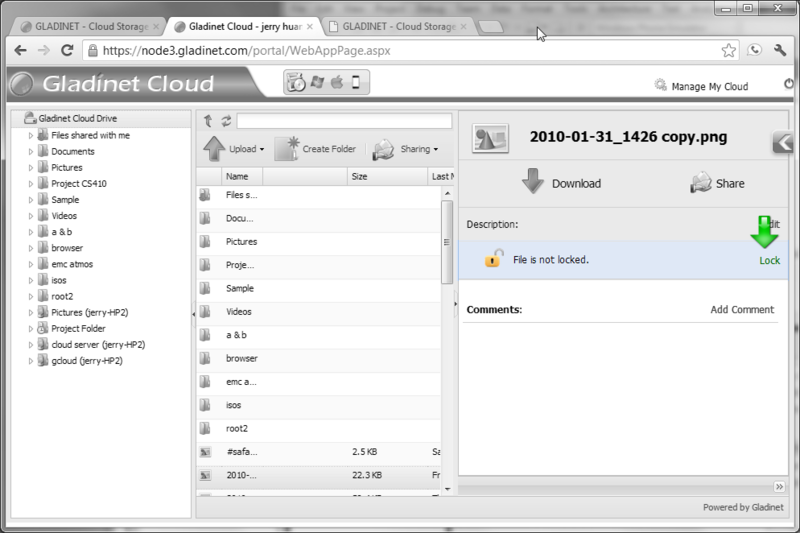 » Instant Migration After you attach a local folder to your cloud storage account, it will immediately appear in your Gladinet Cloud web portal and all Gladinet clients. 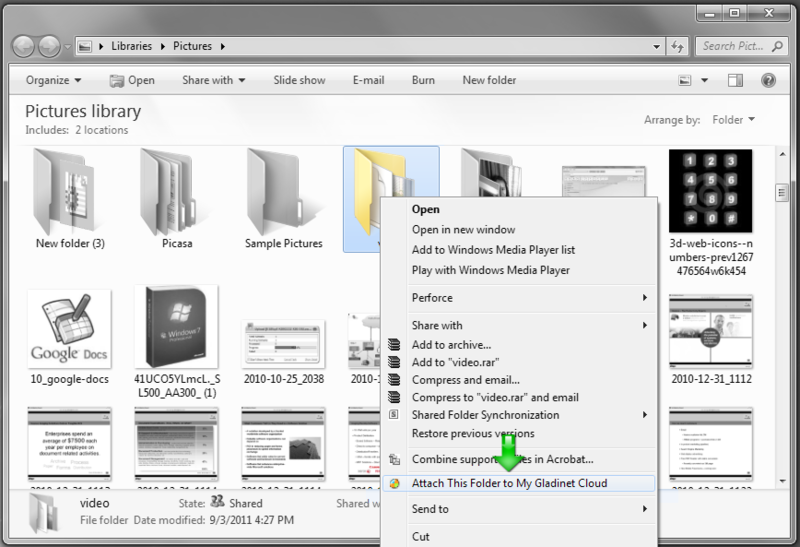 While the sync may still be happening in the background, you can start browsing the folder structure and you will be able to randomly access any file - even before the synchronization is complete. 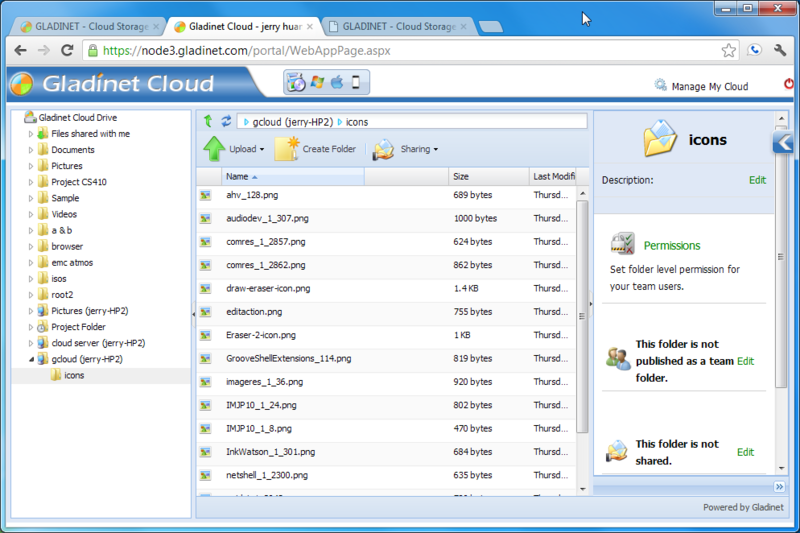 » Unify file server structure from multi-site You can attach local folders from multiple servers in multiple locations to your Gladinet Cloud team account. 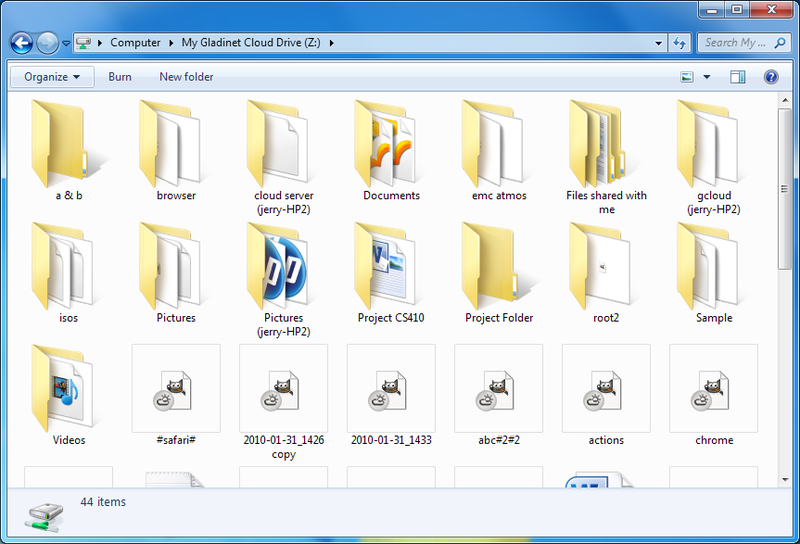 The folders will appear under the root folder of your Gladinet drive to provide a unified view of the file structures across multiple sites. 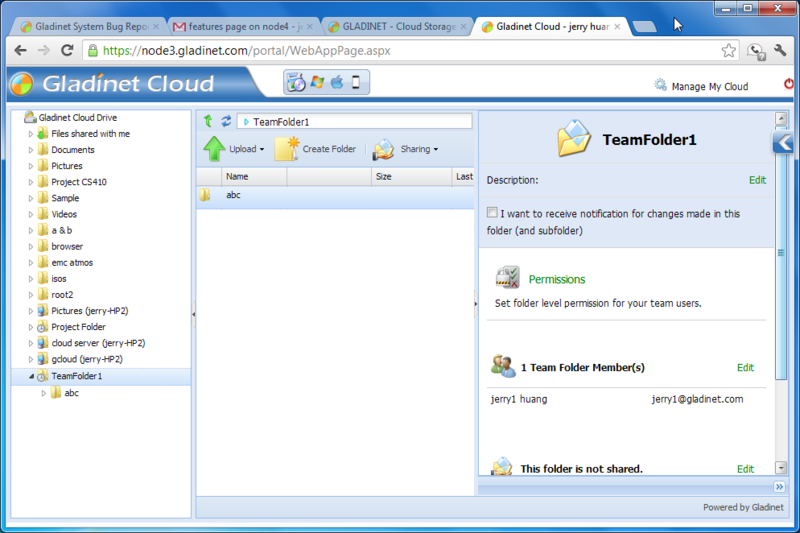 Administrators of the team account can create team folders for collaboration. 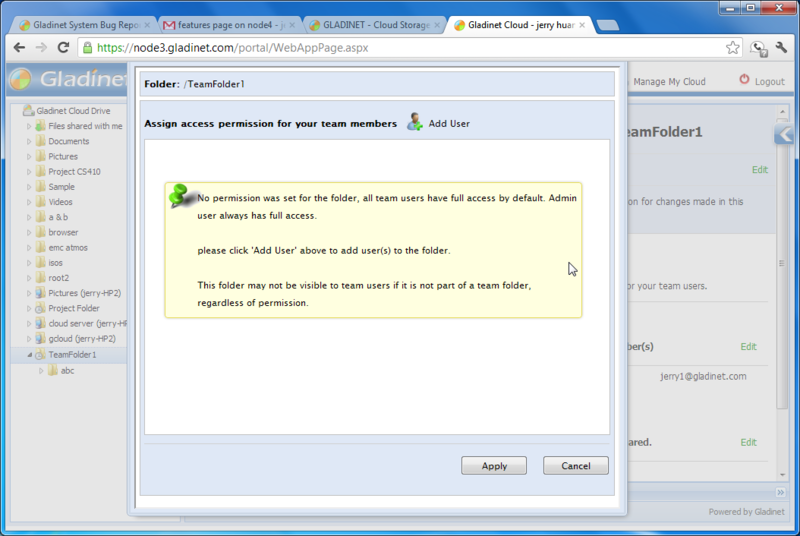 Once a team folder is created and assigned to a user or group, the team folder will appear in the root of their Gladinet drive. 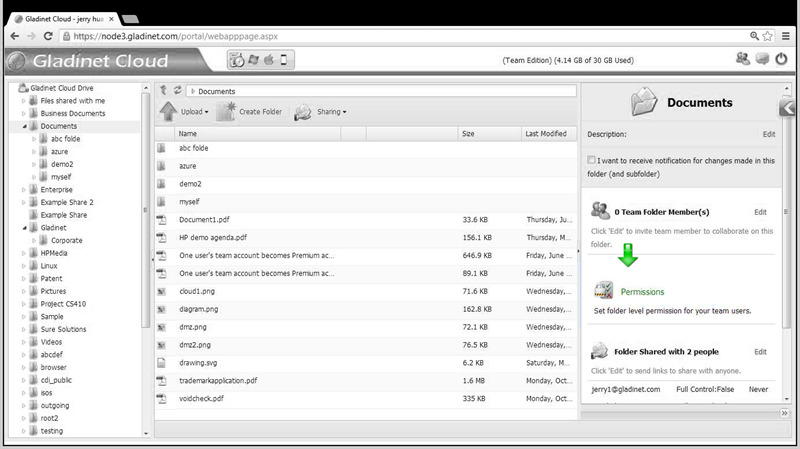 Users can lock/unlock files, add comments and setup notifications. » Share an entire folder with team members You can create a team folder from the "share menu" and then assign team members to the folder. » Assign read-only/full permission to team member Each assigned user can be given full control or read-only permissions. » Fine tune permission at sub-folder level Within the team folder, you can setup folder permission for sub folders. » File locking You can manually lock files inside a team folder. 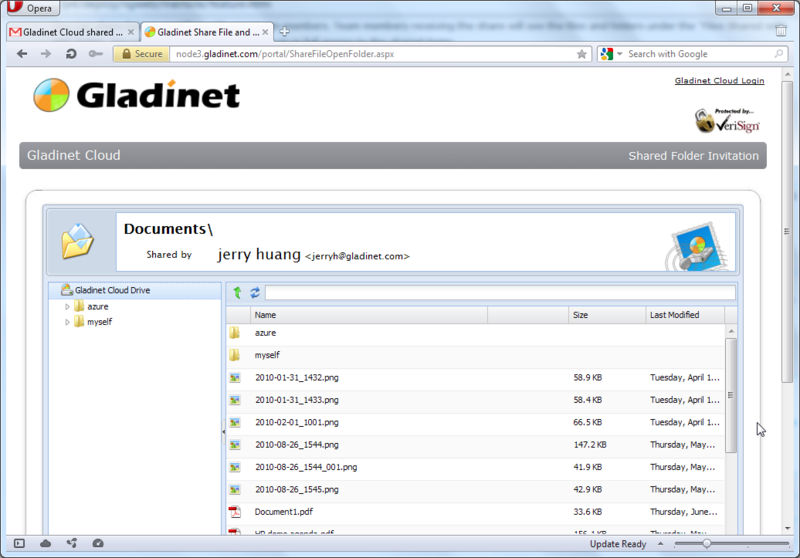 If you are using an Office application from your desktop and save to the team folder inside your Gladinet Drive, the file will be locked automatically. » Versioning By default, new team folders have versioning enabled. 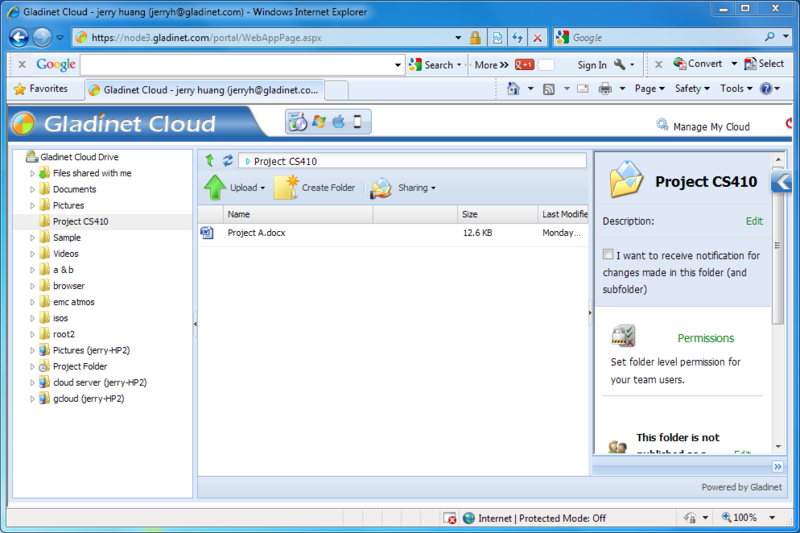 Gladinet Cloud Team Edition provides encryption, file locking, auditing and permission control at the folder level, with client-side enforcement. » Folder Level Permissions Not only can you assign users at the team folder level, you can also set folder level permission for individual folders within the team folder. » Encryption From data-in-transit encryption based on industry standard SSL to data-at-rest encryption, your data is secured between your devices and Gladinet Cloud. » Shared Items Protection There are different methods available to protect items that you shared with the team members and external users. 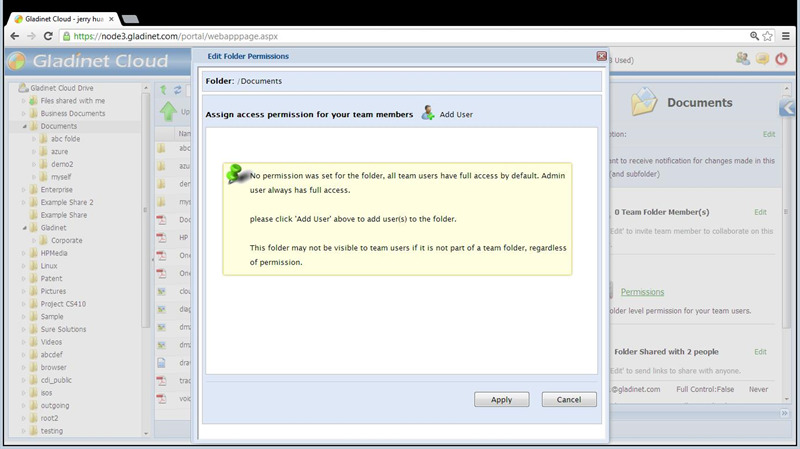 » Team Folder Protection You can assign read-only access or full-control access to users. For users that are not assigned to the team folder, they don't have a way to see the team folder content. 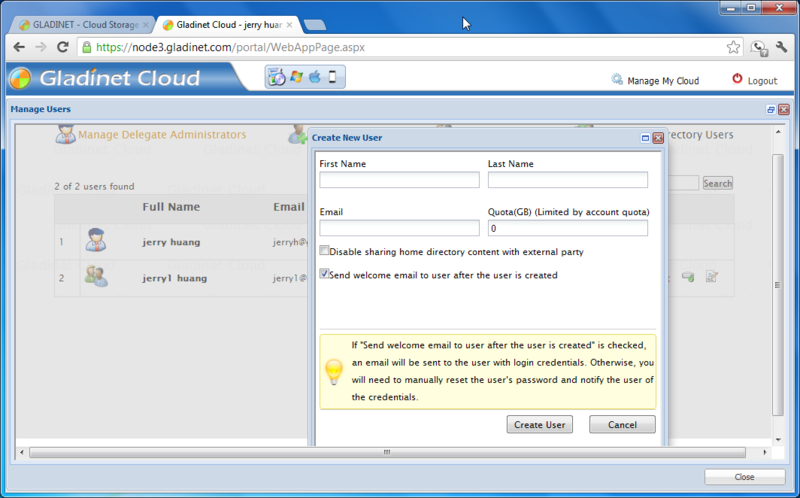 In Gladinet Cloud Team Edition, there are several ways to create a user. You can use the simple user creation form for single users or the batch user import form which allows multiple users to be created at the same time. There is also Active Directory user import which allows you to import users from an existing active directory implementation. 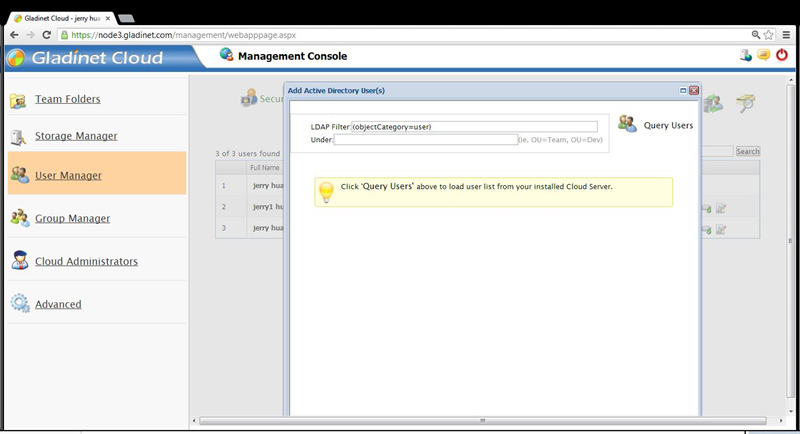 You can also designate multiple team members as delegated administrators. » Simple User Creation From the user manager page, click 'Create New User' and complete the form. A new user will be created. 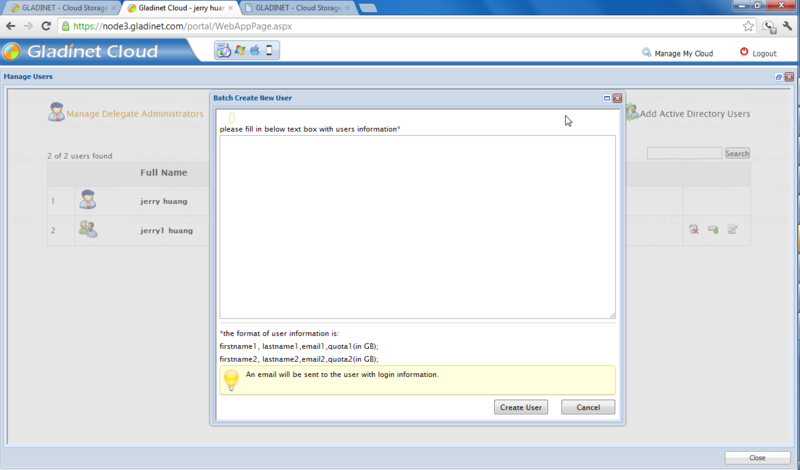 » Batch User Creation You can use a CSV (comma separated value) format file to batch create users. 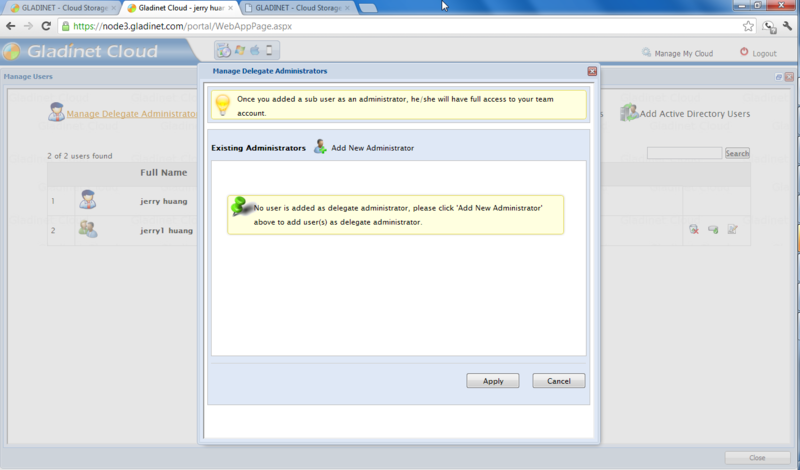 » Delegate Administration The very first user is the default administrator for the account. 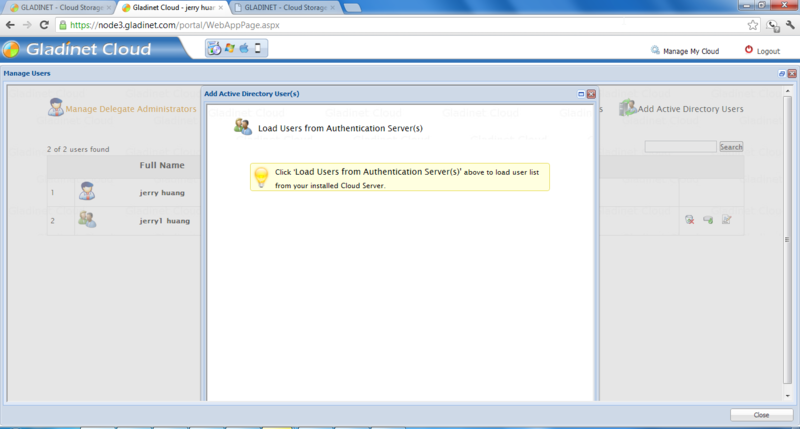 You can also create delegated administrators for the account. 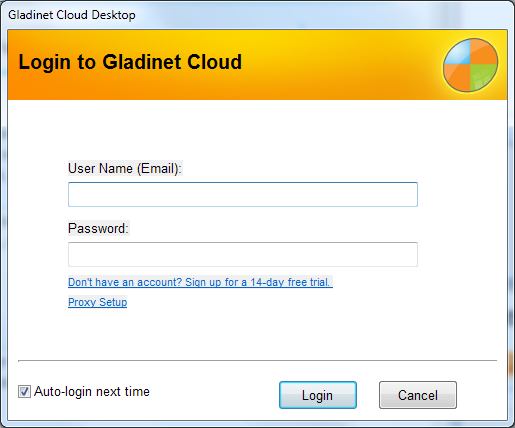 If you have at least one Gladinet Cloud Server installed inside your active directory domain, it can serve as the authentication integration server helping to import active directory users into your Gladinet Cloud team account, with single sign-on. 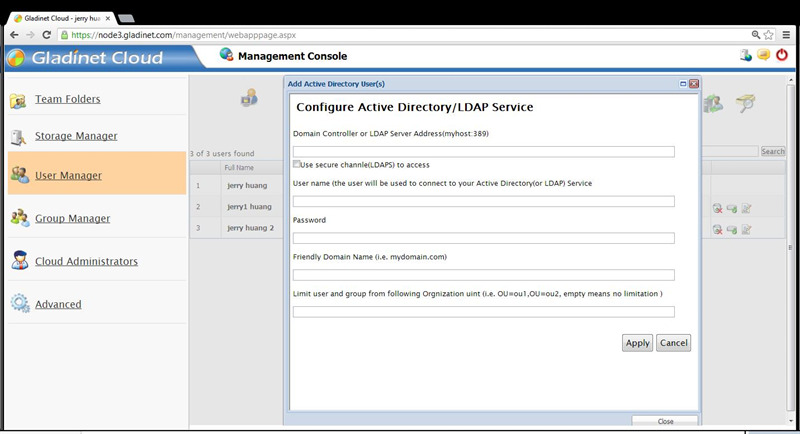 You can also setup LDAPS if it is available. As Gladinet Cloud is being used by more and more businesses, we got more and more user feedback about what they would like to control about their Gladinet Cloud. Some wants to be able to see team user’s account; some wants to disable team-user from sharing home directory files and folders. 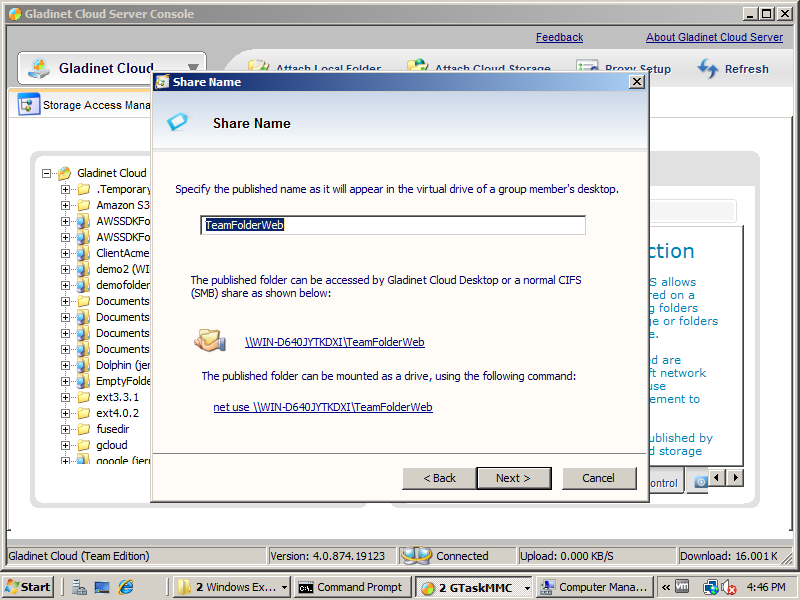 Download the following white paper that documents the group policies in Gladinet Cloud. You can share folders and files with your team members. 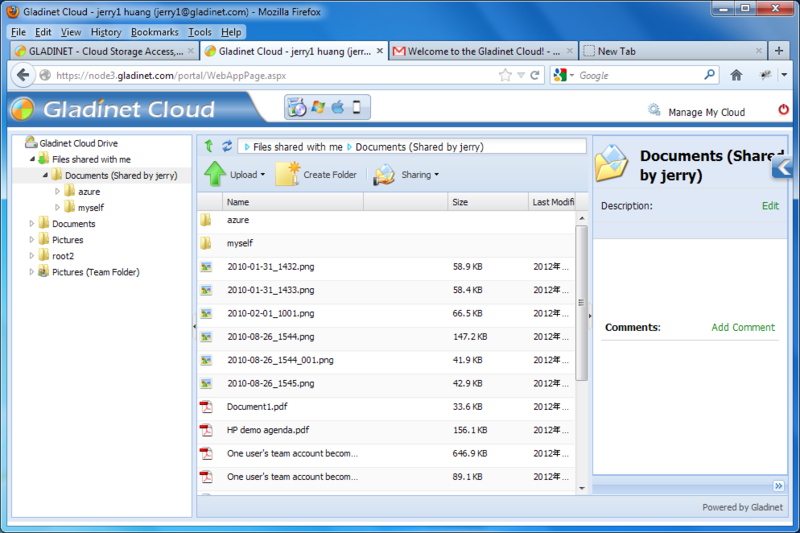 Team members receiving these shares will see the files and folders under the "Files Shared with me" folder. You can assign read-only permission or full access to the shared items. 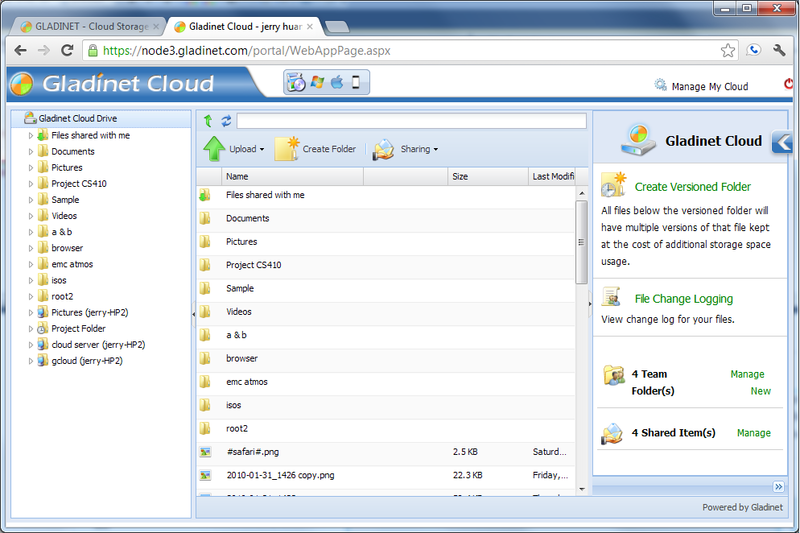 You can also share folders and files with someone outside your team, who doesn't have a Gladinet Cloud account. They can receive read-only access, protected by a password. » Share files & folder (Owner/Sender view) For the owner of the files and folders, it is the same process sharing items with users, whether the user is part of the team or the user is external to the team. » Team Member Receiving Shares Team members receiving the share need to login to their team account to see the shared items. 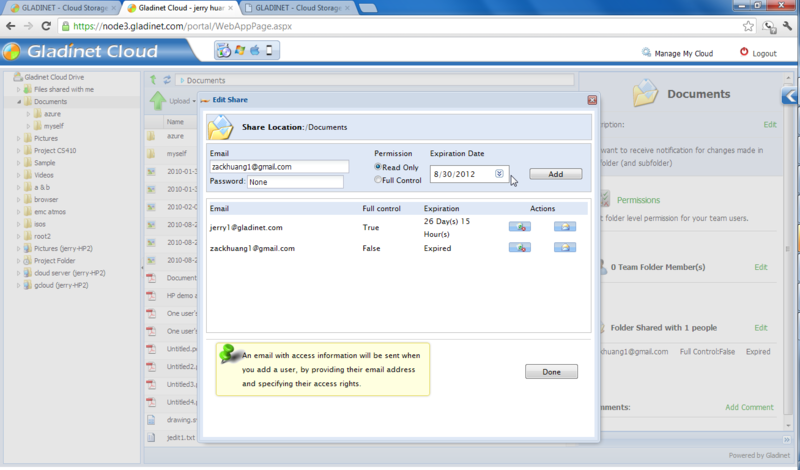 » External User Receiving Shares External user will receive an email invitation about the shared items. 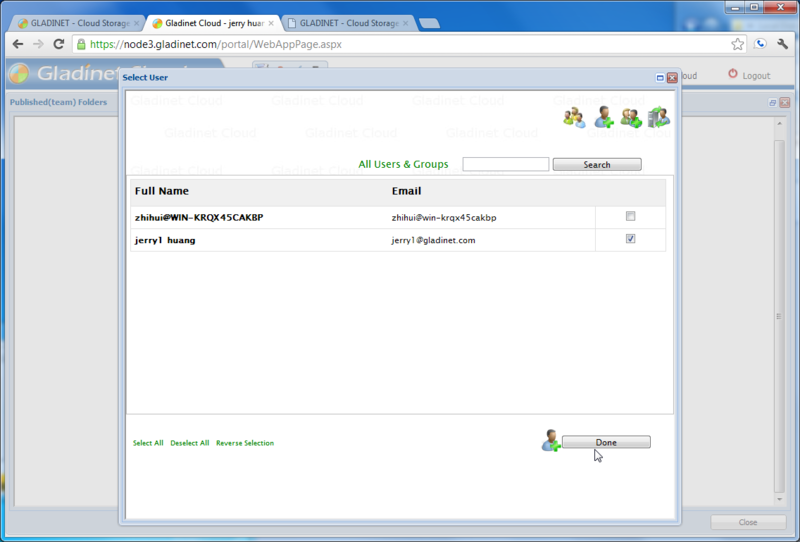 By clicking the shared link and providing a shared password, the external user can view the shared items inside their web browser. 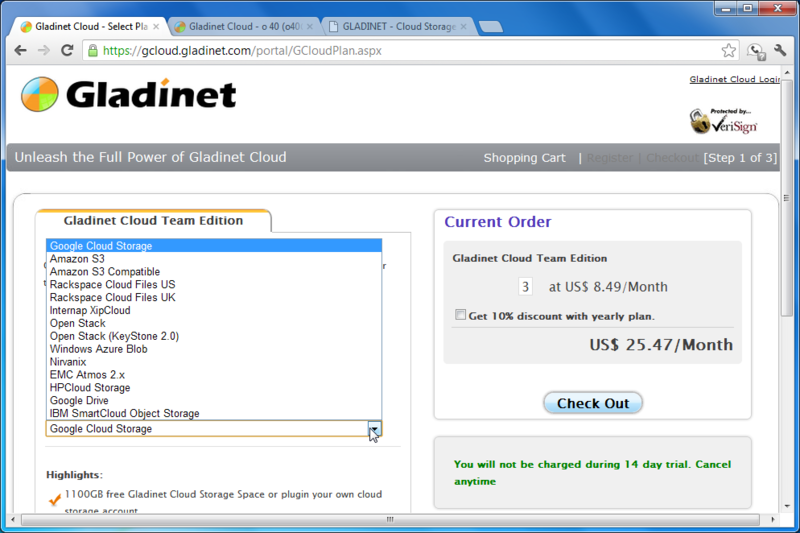 Gladinet Cloud Server is part of the Gladinet Cloud Team Edition. 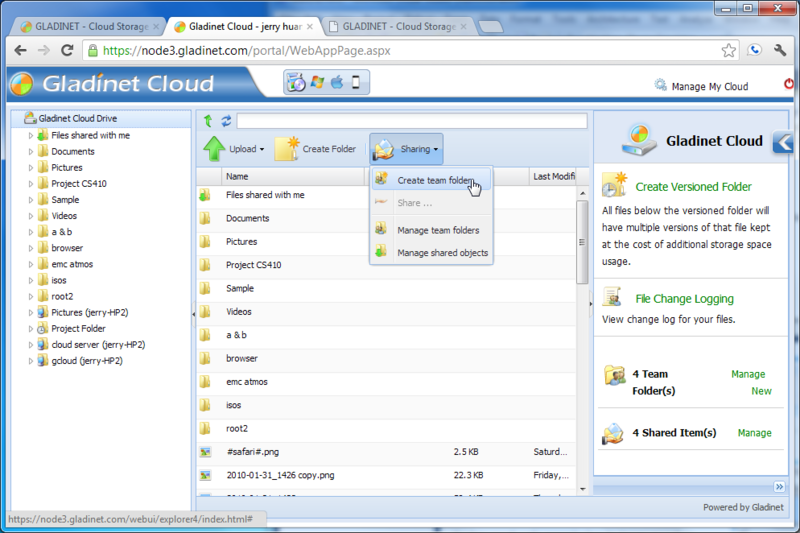 By connecting your cloud storage to a file server, multiple office users can then connect to the file server without a Gladinet client through file shares on the LAN. This has multiple benefits. For example, it unifies file structures across multiple sites into a single namespace and can be used to seamlessly migrate your existing file server to the cloud. 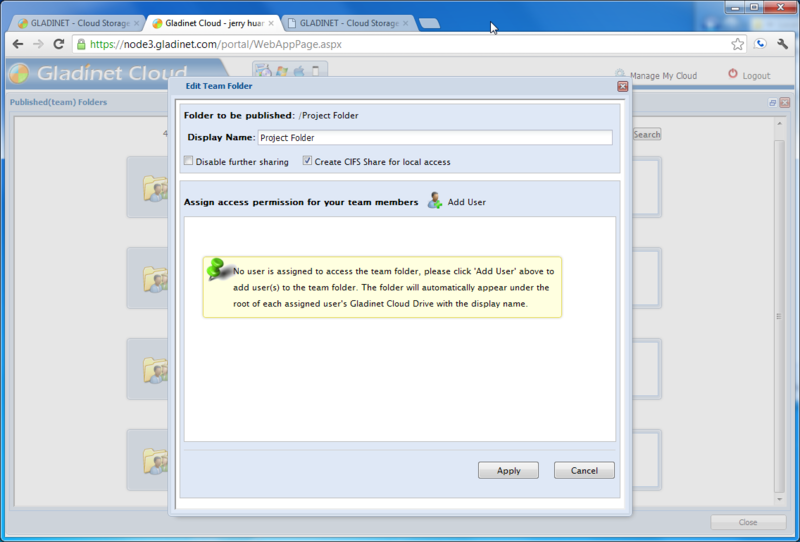 Attached local folders will show up in your Gladinet Cloud team account root folder. 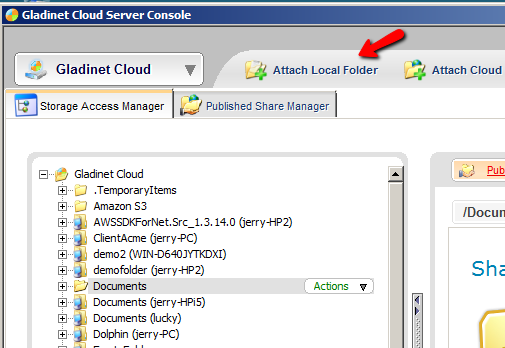 Inside the parentheses next to the folder, a server name will appear to show where the folder is coming from. This provides a unified namespace for distributed file system. 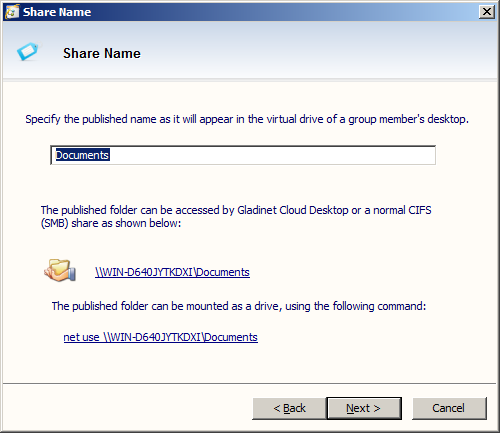 » Publish network shares to your storage account You can take any folder in your Gladinet Cloud account and turn them into a network share on a file server. For Small and medium sized business, this allows you to register with any of the cloud storage vendor first, such as acquiring an Amazon S3 account, Rackspace Cloud Files account and etc. 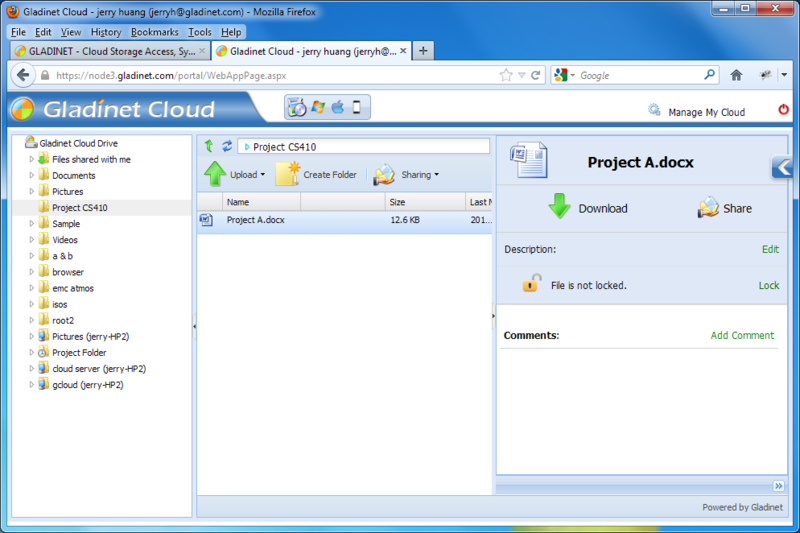 After that you can plug in your storage vendor's account into Gladinet Cloud as the root folder. This way, you maintain full control of the data from the storage vendor. For service providers that need an access platform for their own team cloud storage product, it is also very easy to rebrand Gladinet's service, together with the service provider's own cloud storage solutions, such as OpenStack Swift. 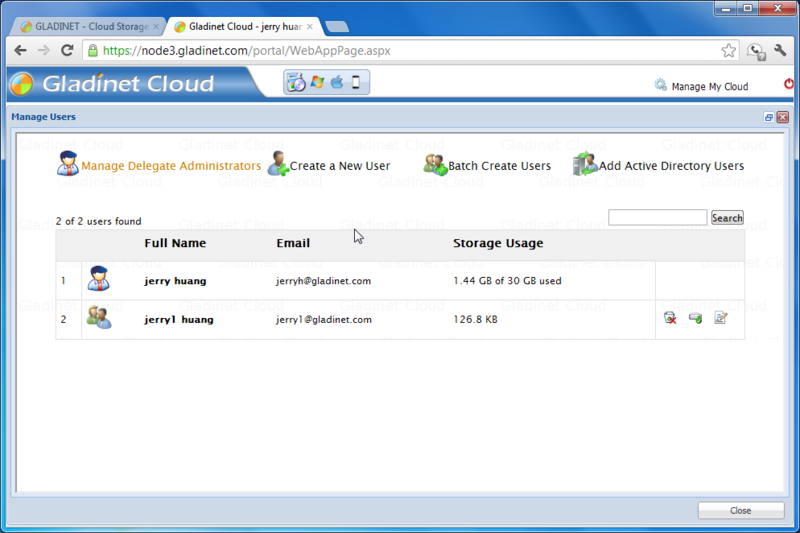 Provide default storage For best user experience, Gladinet Cloud comes with default storage. Use your own S3, OpenStack, Rackspace,Google, Azure, HPCloud, IBM Cloud Storage account as default You can also use your existing cloud storage account if you want more control of your data. For service providers that are looking for an access platform for to create their own dropbox-like or box.net-like solution with their storage, they can white-label and self host the Gladinet Cloud solution. 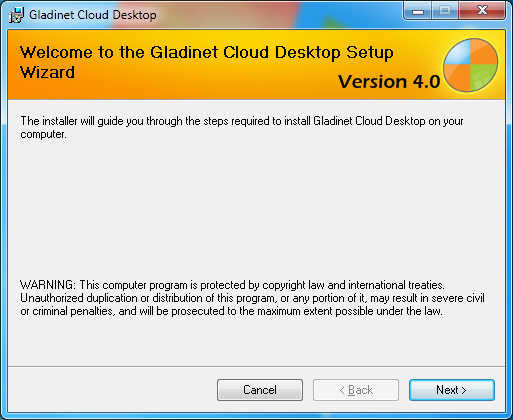 Gladinet Cloud Cluster is built on top Microsoft Web Platform and can be installed with the Microsoft Web Platform Deployment tools on Windows Servers. Our Solution. WE Host. YOUR Brand. You can pick any of the Amazon EC2 region and we will host the solution for you, with your brand. Our Solution. YOU Host. YOUR Brand. 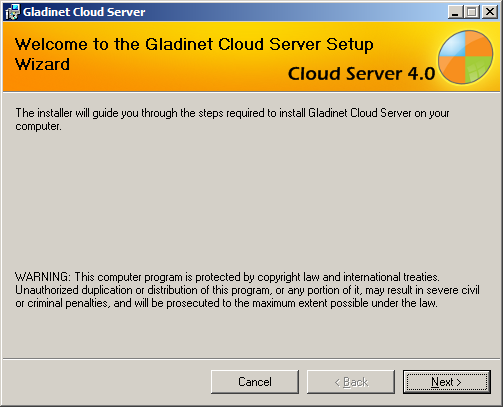 You can install Gladinet Cloud solutions on your own servers.